The works on this recording embrace a varied miscellany of Peter Maxwell Davies’ orchestral output from the early 1990s. The ‘choreographic poem’ The Beltane Fire pits the sternness of the Reformation clergy against the pagan traditions of the Orkney Islands. Concerned with environmental pollution, The Turn of the Tide ultimately reaches “a triumphant dance of all creation”, while the Threnody and Pavan are poignant memorial tributes for significant figures in the composer’s life. 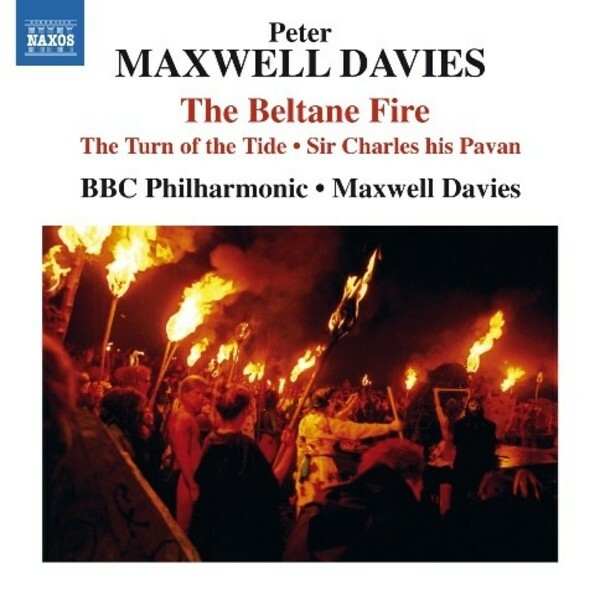 This new release is a collection with a great deal of variety, reviving a Collins Classics recording of The Beltane Fire which Gramophone considered “excellent performances… from the Maxwell Davies/BBC Philharmonic partnership; the recordings are clean and vivid”. The BBC Music Magazine also admired “the combined forces of four children’s choirs from Manchester [who] acquit themselves magnificently in the final hymn to unsullied nature” in The Turn of the Tide, a work which holds as much resonance today as it did in the 1990s for those concerned about our environment.